Sent from a far planet to save humanity, bitten by a radio-active spider to learn that its effect comes with great responsibility, or perhaps the chosen one to inherit a power and help those who are less fortunate in life. Heroes have origin stories and Cape and Cowl’s is of a young man’s dream to be all that he can be. 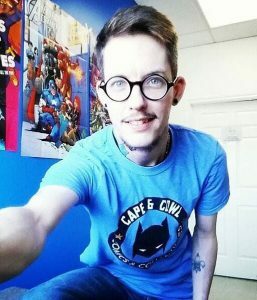 Cape and Cowl Comics and Collectible’s origin was in the idea of an entrepreneur who grew up in Fall River, and dreamed to bring geek culture and literacy back to the rural area of beautiful Nova Scotia, Canada! With a focus on youth and learning, local kids and families can re-connect with the love of reading through the wonderful medium that is comics and graphic novels! Also bringing you the board games, card games, toys, and collectibles you love, (or should love), we want to be your one-stop geekery shop while always ready to suggest something new to suit your tastes. Running birthday parties, craft fairs, movie nights, and game tournaments, the list of community events hosted by Cape & Cowl will grow and grow! We are so happy to be here! My name is Jay Roy, and I am the owner of Cape and Cowl Comics and Collectibles. I am hard-working, well organized, driven, and happy to sing the praises of this community who have helped me grow this business in ways I never would have thought of. I spent my formative years up to age twenty-one in Fall River, went to high school in Bedford, lived in Dartmouth, and attended university and established a life as a director and comic seller in Halifax. With my friends and family, and this amazing community behind me, I feel confident this venture will be a great success, even with the many obstacles that face small businesses! Cape and Cowl Comics and Collectibles is at Cape and Cowl Comics and Collectibles.